Etro – WHAT IS JAMES WEARING? 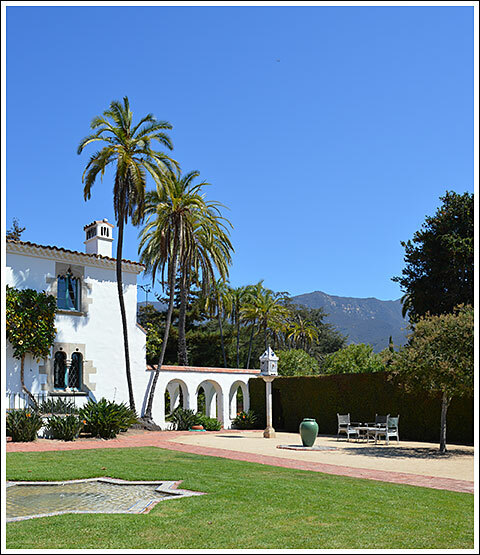 Yet another stellar suggestion by our dear friend Philip Bewley: Casa del Herrero – definitely a must see when one is in the Santa Barbara/Montecito area. It’s the legendary estate that once belonged to George Fox Steedman, and it happily remains very much intact. Considered one of the finest examples of Spanish Colonial Revival architecture in America, it is the result of a marvelous collaboration between Steedman and Santa Barbara architect, George Washington Smith. Like Hearst and Morgan at Hearst Castle, Steedman and Smith incorporated many architectural fragments into their Casa del Herrero design—in fact, Steedman actually purchased many of said fragments from the same dealers that Hearst utilized. Certainly it was a labor of love and there is a real sense of Steedman’s passion and personal touch throughout this gracious Montecito estate. Do visit if you can. Following our Casa del Herrero tour, the lovely Penelope Bianchi and Hollye Jacobs treated McBee and me to the most gorgeous luncheon at The Coral Casino, a super-chic private beach and pool club on Butterfly Beach, recently refurbished by Peter Marino. You’ll know Bianchi from her interior work and blog at Penelope Bianchi, McCormick Interiors and Jacobs, as author of The Silver Pen. We were also joined by friends, La Comtesse Lola and Brooke Giannetti (author of the Velvet & Linen blog) – as you might imagine, we had a pretty stimulationg conversation regarding interior design, design related blogs, and all things beautiful. After our lovely luncheon, we headed to Bianchi’s home for a tour—I’ve seen images of Bianchi’s home on many occasions, but nothing could have prepared me for the actuality! 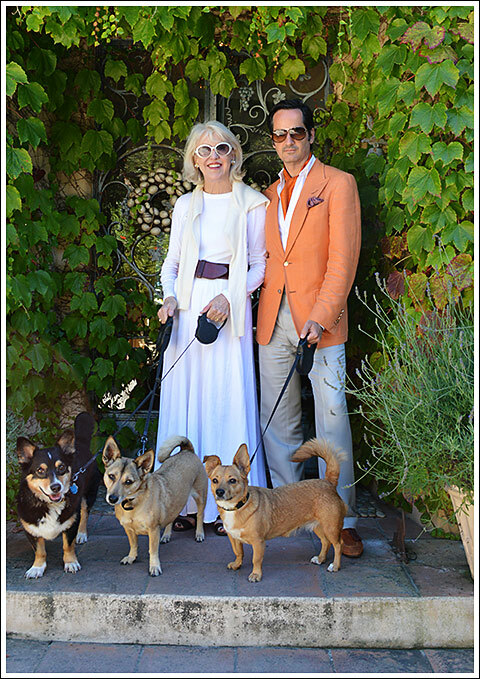 Bianchi’s exquisite eye and a goodly amount of bravura make her home and glorious gardens the most perfect paradise…and all is enlivened by a delightful collection of beasts—from rescue corgi-mixes and cats, to ducks and Belgian Millefleurs d’Uccles chickens! 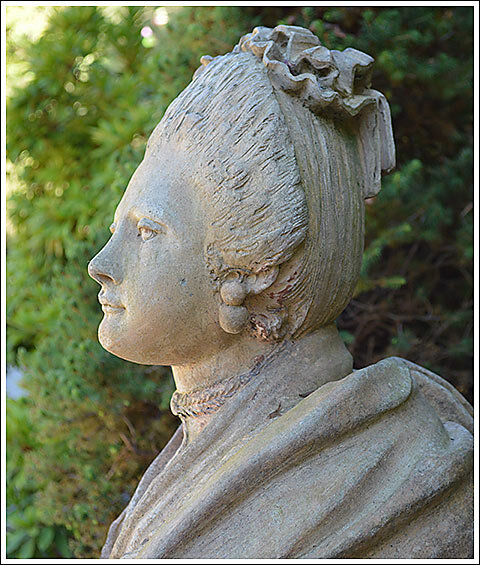 One of a pair of Madame du Barry sphinxes flanking the entrance to the Bianchi home. Later, we returned to the Coral Casino where Bianchi and her husband. Adam, graciously treated us to a superb sunset dinner at the elegant upstairs dining room. What a way to end our stay in Santa Barbara. I simply cannot wait to return and see all of these gorgeous people again. 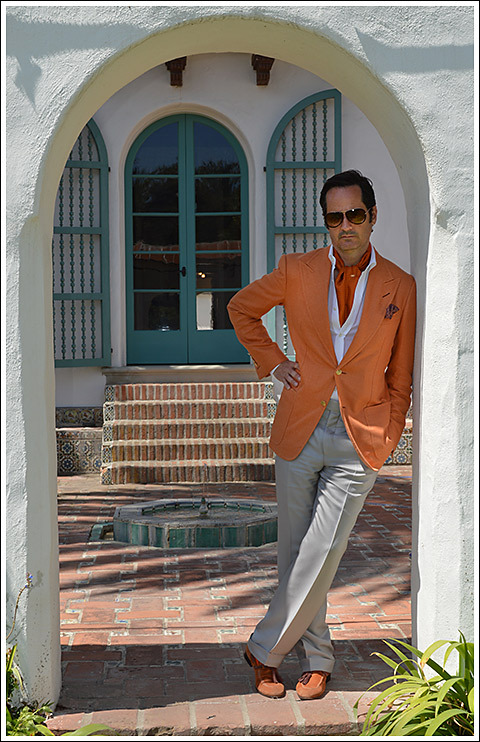 Channeling an old school “Hollywood” vibe, I’m sporting a Tom Ford tangerine silk basket weave “Spencer” jacket and dove grey silk pant, Gucci white cotton voile safari shirt, a silk “Disco Fever” pocket sqaure from Pochette Square, a Le Noeud Papillion orange silk polka dot ascot, Tom Ford “Cyrille” sunglasses, Rolex watch, orange suede tasseled loafers by Etro, and my fragrance is Creed Orange Spice. Frightful weather, along with the many unpleasantries that accompany it, certainly can present one with a major fashion conundrum—no one wants to see their lovely Louboutin’s ruined or the crease in their trousers completely obliterated in wet weather. And so, today I bring you my dreary day essentials: a ravishing raincoat that will actually keep you and your clothing safe and dry, a super chic umbrella, wonderful wellies, and a scrumptious silk scarf to add a bit of personal panache. The point is, there’s absolutely no reason one can’t cope with a dreary day and a gloomy mood when you’ve equipped yourself well. 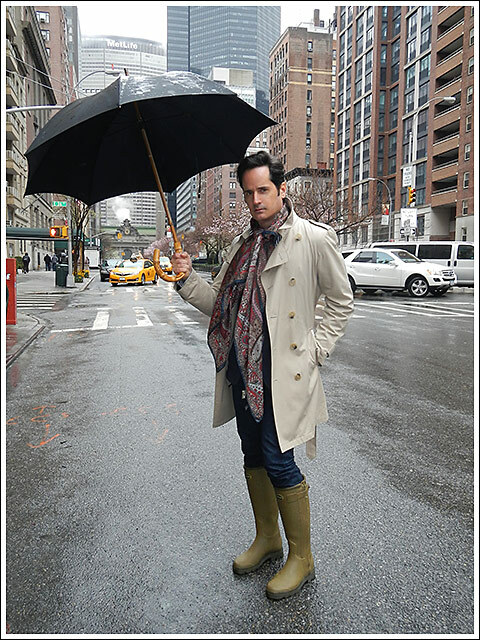 The classic double breasted Allegri trench coat I’m wearing (above) is a timeless piece. It’s constructed from a double twisted cotton gabardine that is treated to be both waterproof and breathable. Swaine Adney Brigg’s joyously eccentric Whangee umbrella is my favorite for Spring/Summer rain. The best Wellies on earth are of course made by Le Chameau… Chasseur wellies in this gorgeous olive green are my go-to footwear for inclimate weather. Apparently the whole House of Windsor happens to champion Le Chameau—and they really do have some pretty awful weather to contend with! The finishing touch is my over-the-top silk paisley scarf by Etro—wearing this never fails to take the edge off of a gloomy New York City day. And as usual, a misting of Creed’s Original cologne is also quite helpful when looking to lift one’s spirit! As an interior designer, I’m actually acting as a curator for my clients—they pay me for my eye, for my ability to edit, distill and procure. I’m drawing upon my experience and expertise—my knowledge of art, antiques, furniture and decorative objects—to bring together a cohesive collection of beautiful things that’ll live together in the environments I create. Of course I continually hone my sensibilities through travel, and I keep my finger on the pulse of what’s happening closer to home as well, at art museum exhibits, galleries, and auction houses and anywhere that inspiration can be found. Needless to say this role as curator gives me huge pleasure and I’m always on the prowl for the most perfect pieces. Recently at the Ralph Lauren Home Collection showroom I fell in love with the very handsome life size wooden horse pictured above. 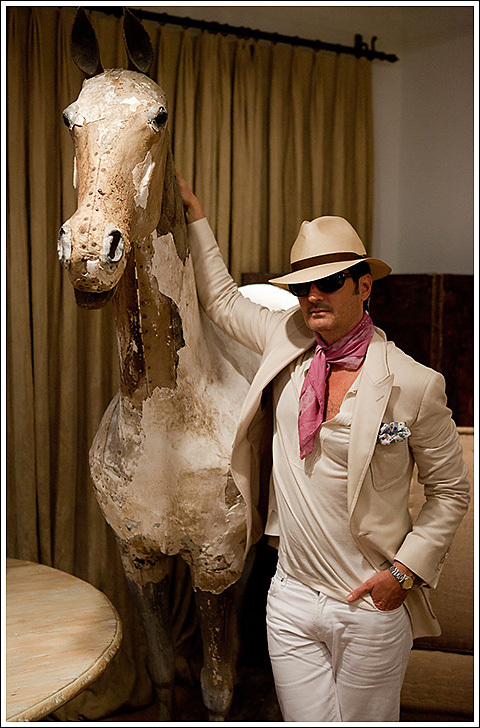 Many of my clients are horse people so I’m pretty sure there’ll be a fight over this unique piece—it’d certainly make a dramatic statement in any of the equestrian themed rooms I’ve created for them! I’m captured at the super chic Ralph Lauren showroom sporting a vintage Worth & Worth parabuntal straw hat, Gucci pale sand silk jacket, Michael Kors ivory cotton knit shirt with crocheted placket, Uniglo white denim jeans, Etro floral and paisley silk pocket square, Tom Ford cotton voile scarf, “Nicolo” sunglasses and brown leather sandals, vintage Rolex watch and my fragrance is Tom Ford Lavender Palm.